Every weekday, CPTV Kids provides 11.5 hours of non-commercial, educational children’s entertainment from PBS Kids. The PBS Kids schedule is periodically updated to ensure that PBS Kids is engaging with its audiences as much as possible. Changes are developed in partnership with member stations and are based on research to help provide viewers with the programs they love at the times of day that work best for them. Beginning January 1, 2018, CPTV Kids will feature a new weekday lineup to help meet these goals. Check out the new schedule below! Plus, in February 2018, the brand-new animated series Pinkalicious & Peterrific will air weekdays at 9 a.m. and 2:30 p.m. 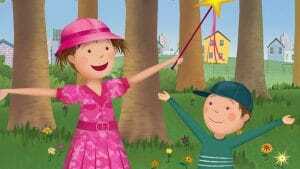 Starting Monday, February 19, follow the adventures of Pinkalicious and her brother Peter. Pinkalicious imagines creative possibilities everywhere she looks. She is an artist at heart, and, like most creative people, she sees the world differently from others. She knows what she likes, and is not afraid to express herself — though she sometimes needs help from Peter and her neighborhood friends. Designed for children ages 3-5, Pinkalicious & Peterrific encourages kids to engage in the creative arts and self-expression, covering areas such as music, dance, and the visual arts. For more information on the series, click here.